An erect to sprawling annual, up to 70cm tall. Stems a very dark purple-black, leaves a darker shade of green. Leaves wrinkly and entire to coarsely dentate. Leaves may sometimes be deeply cordate (with 2 rounded lobes at the rear either side of the stalk). Leaf edges repand (with irregular smooth, small-amplitude ripples on the edge). Flowers white, berries green at first. Leaves dull-green, pointed towards the tips and with one or two shallow lobes at the rear and often with 6 sides. The stems are sometimes blackish, but here a darkish purple. Five white and widely separated triangular-shaped petals, often swept backwards. Five yellow stamens, clumped as one, protrude rudely from the centre. Flower stems are shortish and emerge in multiples from a single point (unlike those of Bittersweet where the flower-stems split into pairs at 120° angles); they have short appressed hairs; leaves stiff and curved, sometimes crimped. Berries starting to form where the flowers once were. Yellow protruding stamens all bunched together. Petals held wide open or reflexed. Un-opened flower lower left, berries developing in some of the sepal cups. Five bright-yellow stamens bunched together in a barrel-shape. Petals have short hairs. Single lime-green semi-globular style protrudes from within the stamens. The petals are slightly hairy on the edges, as are the leaves where the short hairs or bristles seem to point forwards in pairs. The five yellow stamens look inseparable. Diamond shaped sepals either greenish or concolorous with stems with five teeth. Very short non-glandular hairs appressed to stalks on ssp. nigrum (rather than standing proud as in ssp. schultesii). 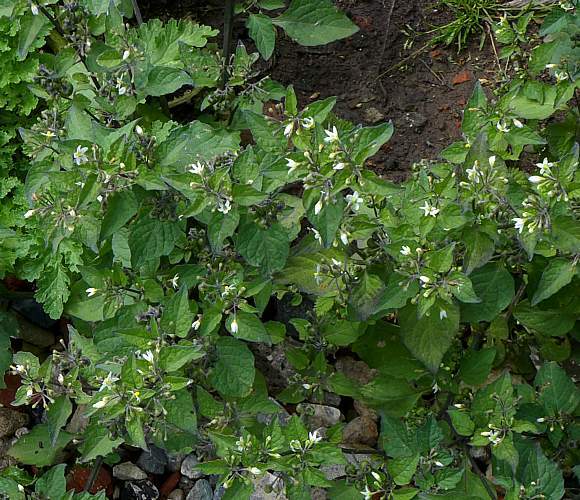 Berries are green, turning black, hence the name: Black Nightshade. Not as large as the berries of Deadly Nightshade. 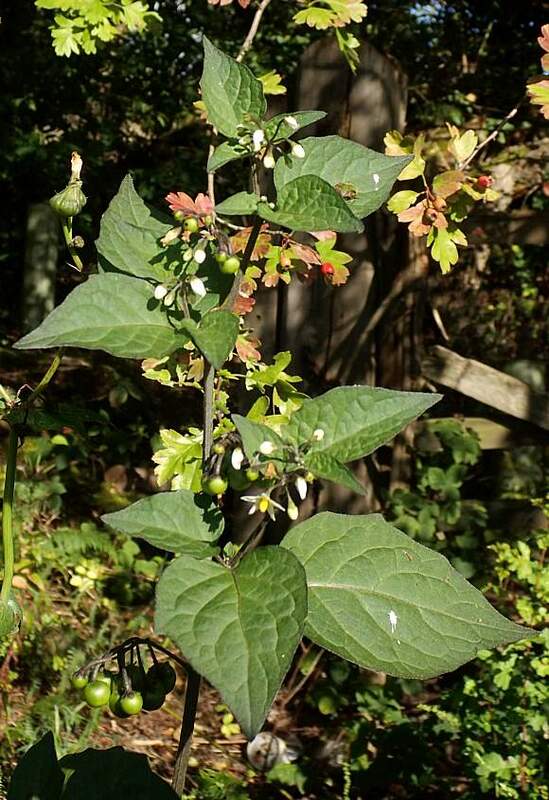 Leaves have prominent veins, and scattered short hairs flat on the leaf facing forwards. Leaves so lobed as to have the appearance of having six edges. Berries have a small dark-purple spot where the style once was. The berries, which rarely remain green, ripen to purplish black. 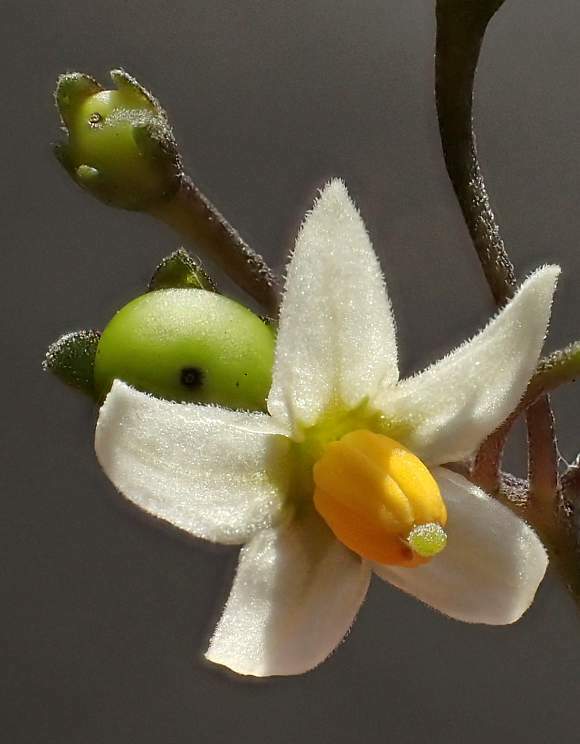 The sepals curl upwards away from the berry. The berries turn satin-black. Stems ribbed, with tiny knobbly projections. 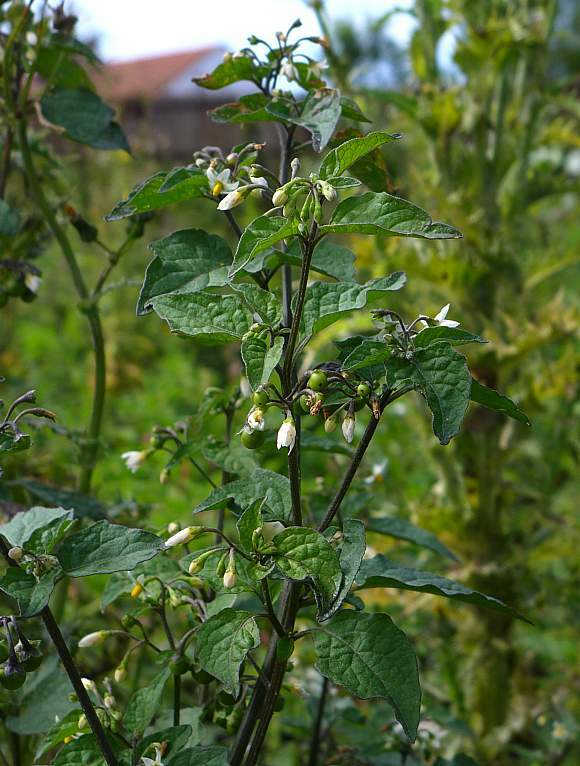 Sub-species : There are two sub-species, both commonly called Black Nightshade: Solanum nigrum subsp. 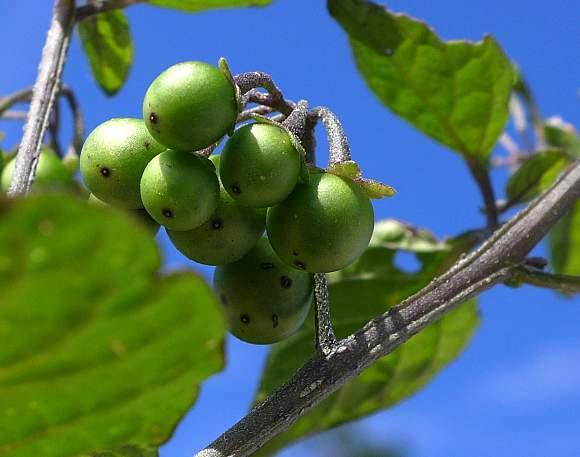 nigrum and Solanum nigrum subsp. schultesii. 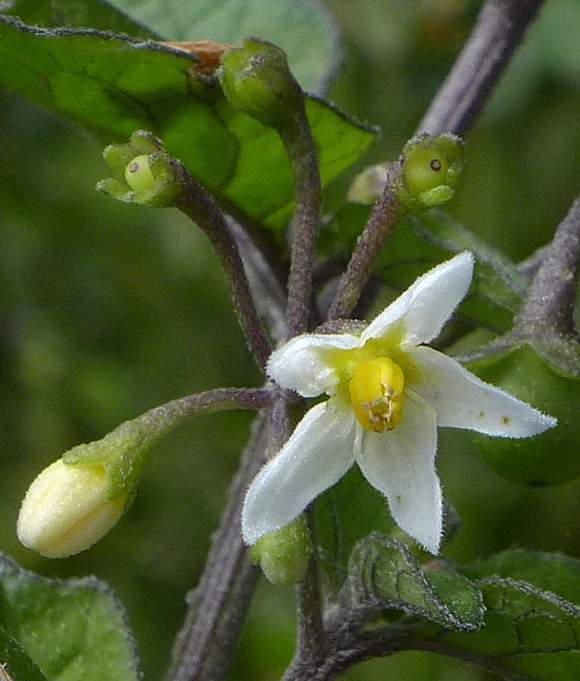 Whereas Black Nightshade (either sub-species) is shown as widespread especially in the south of the UK, those which have been identified to sub-species level are not shown with the same combined distribution (probably because no one around the areas they are missing from have identified them to sub-species level). Thus ssp. nigrum is shown as more confined to the South and East whereas ssp. schultesii is much less widespread and confines itself mainly to the SE of England. Clearly, the sub-species maps are not up-to-date, but that is true for most distribution maps of any plant having sub-species. 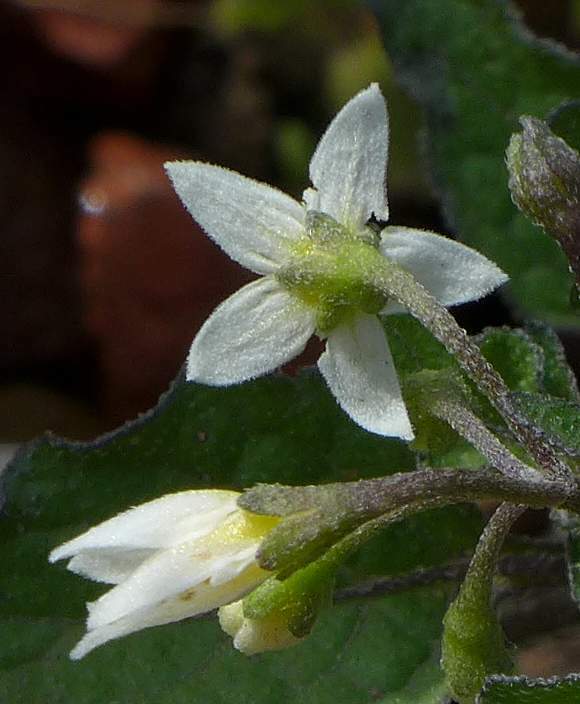 Some similarities to : Bittersweet (both are of the Nightshade Family, but Black Nightshade has white-petalled flowers whereas Bittersweet has purple ones. 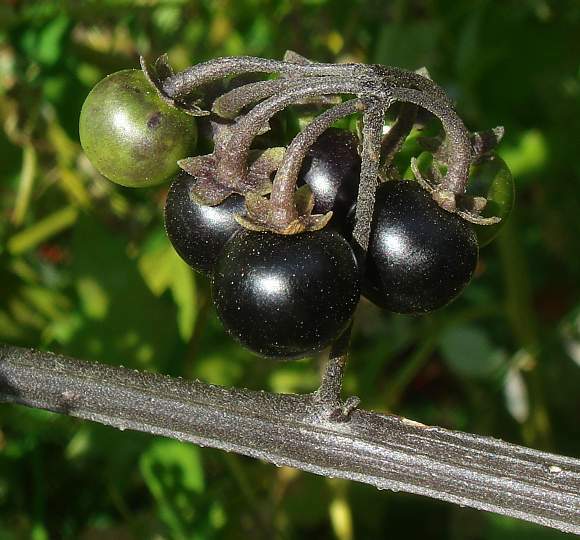 The berries of Bittersweet, green at first as are those of Black Nightshade, turn red, whereas those of Black Nightshade turn black. 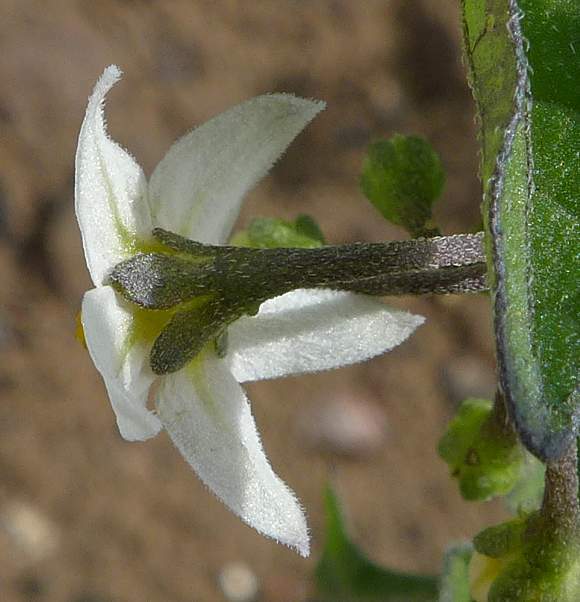 The flower stems of Bittersweet bifurcate in two's, whereas those of Black Nightshade split into several at the same node. 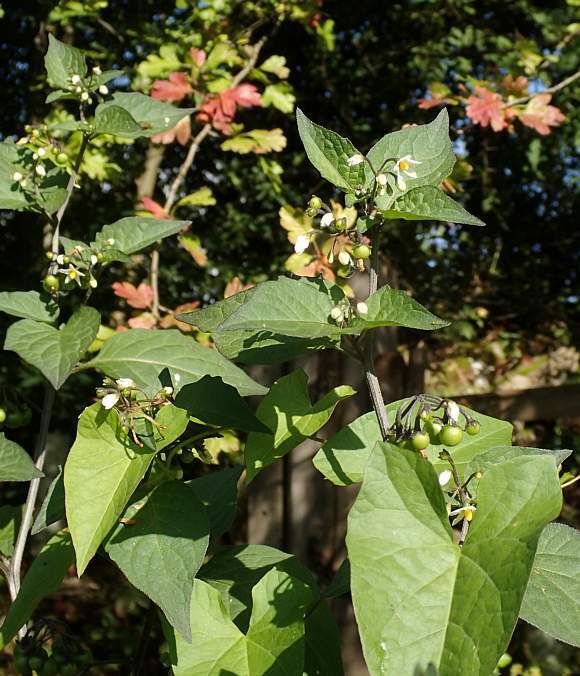 Distinguishing Feature : The white five-petalled flower with swept-back petals and a central yellow column of five stamens bunched together into seemingly one, together with the small black berries. Habitat includes waste places and farmland. 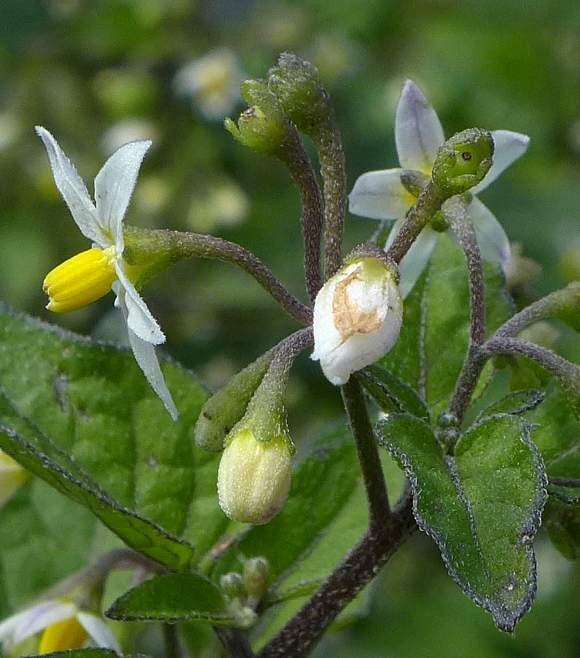 Black Nightshade (Solanum nigrum ssp. nigrum), a native with non-glandular often sparse hairs that are appressed to the surfaces. 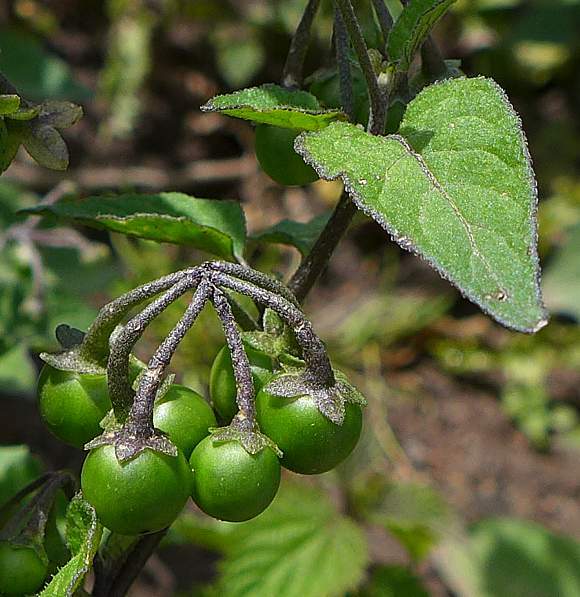 Black Nightshade (Solanum nigrum ssp. schultesii), an introduced and naturalised plant with glandular hairs that are patent (stick out). The above plants all correspond to the ssp. nigrum sub-species. 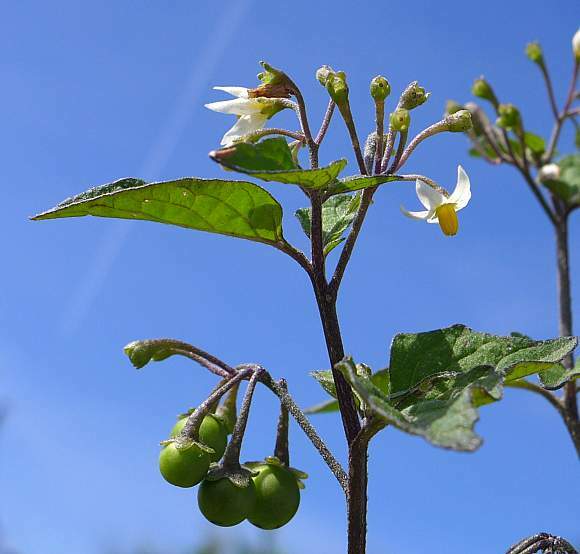 Like most plants belonging to the Nightshade Family, Black Nightshade contains poisonous solanines , in this specific case Solasodine and Solamargine . Solanines are poisonous steroidal alkaloids and steroidal glycosidic alkaloids. 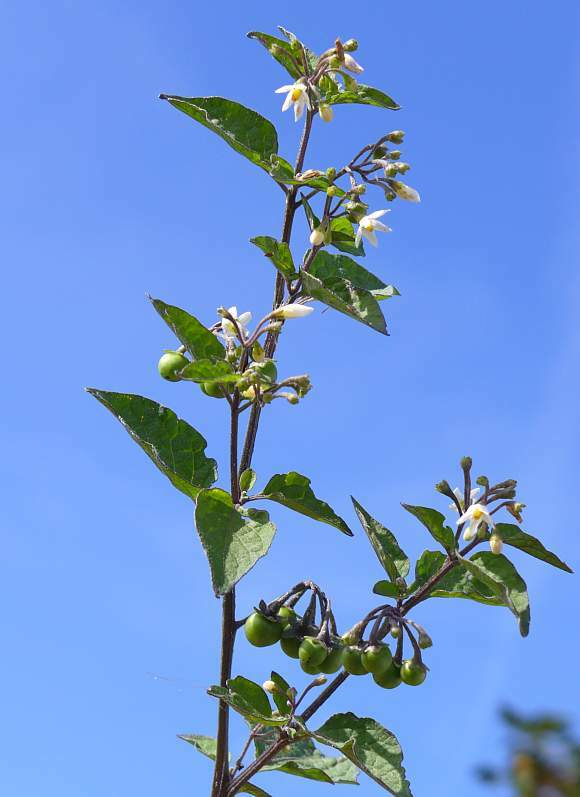 Solamargine is found not only in Black Nightshade but also in Thorn-Apple (Datura stramonium) (both of which belong to the Nightshade Family) and has potent cytotoxic activity on both hepatocytes and skin cells, initiating cell death by apoptosis. It also inhibits the growth of cancerous cells. 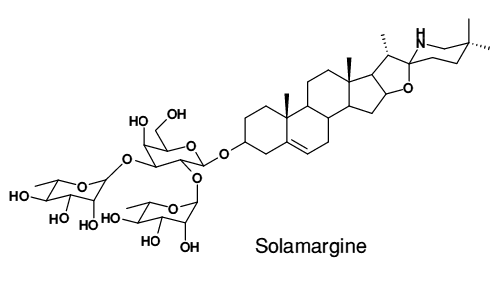 Solamargine together with a symbiont Solasonine (another steroidal glycosidic alkaloid) has found use in a cream for external application to treat malignant melanomas (skin cancers), benign tumours and keratoses of the skin. Solasonine (not shown) is also found in Thorn-Apple (Datura stramonium). 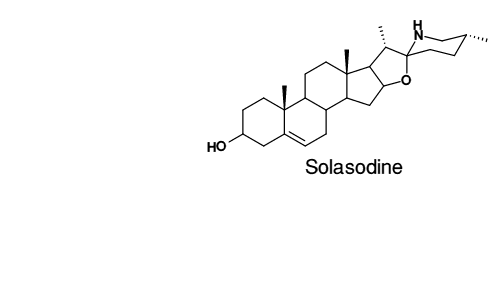 Solasodine is a steroidal alkaloid and the aglycone (without sugar moieties) of the steroidal glycosidic alkaloid Tomatine found in un-ripe (green) Tomatoes (which is another member of the Nightshade Family). 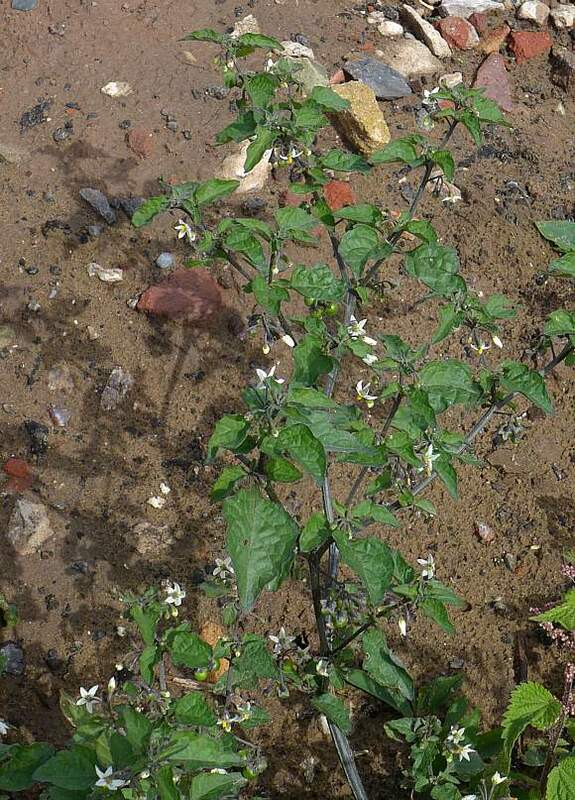 Tomatine is shown below for illustration purposes only, as far as is known it does not occur in Black Nightshade. 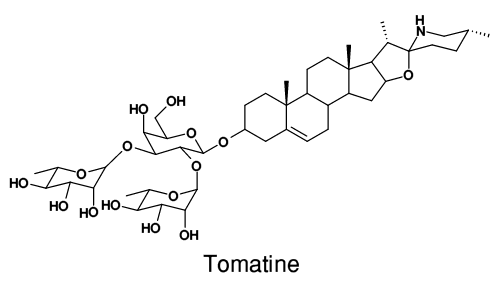 Note how there is only a single methyl group (CH3) difference between Tomatine and Solamargine (in the upper right hand corner).